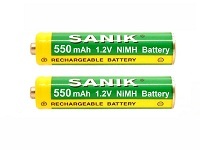 Replacement 2.4V NiMH 500mAh battery pack for the Sagemcom D77V range of cordless home phones. When your new battery is first installed in the handset, it is usual to charge the battery for the recommended time as stated in your instruction manual. This is usually between 16-20 hours before use. After the initial charge period, your new battery should work normally.